Wrinkle Ridge Bulldogs is dedicated to providing the best breed of bulldogs that you can find. 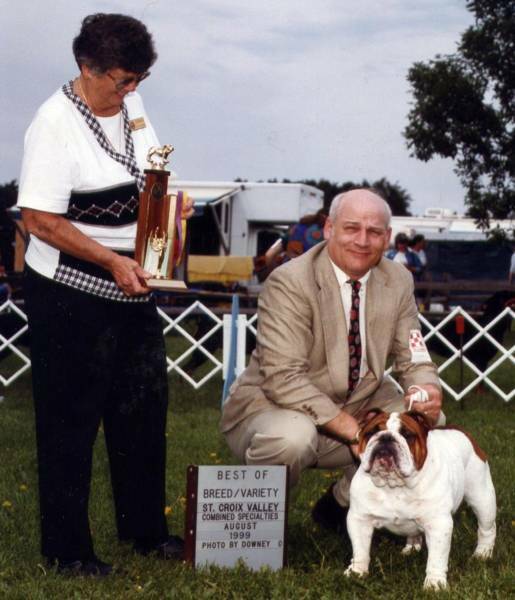 If you are looking for an English bulldog in Minneapolis or an English bulldogs in Wisconsin, Minnesota or anywhere else then we are the bulldog breeders to contact. In the beginning.......... after having English Bulldogs for several years and being astonished by their awesome character and even "human like" nature, we decided to raise them. Following a world of study on the breed and care for them, it was time to find a pair of excellent quality females. No stone was left unturned in the quest to find the best English Bulldog breeder . The journey ended at Big Mac Bulldogs owned by Mike and Arlette Kottke. There was no question about their knowledge and effort set forth to create the best bulldogs possible! As a true blessing, they had two female puppies(Brooke & Charlott) with an endless amount of champions in their pedigree. In conclusion, this was the foundation of Wrinkle Ridge Bulldogs. As you have read, the bar was set extremely high when it comes to quality and we strive to keep it there.